I'm a day behind, because I wasn't able to post this one when I wanted to, sorry! Don't worry, tomorrow I'll be posting two days at once. 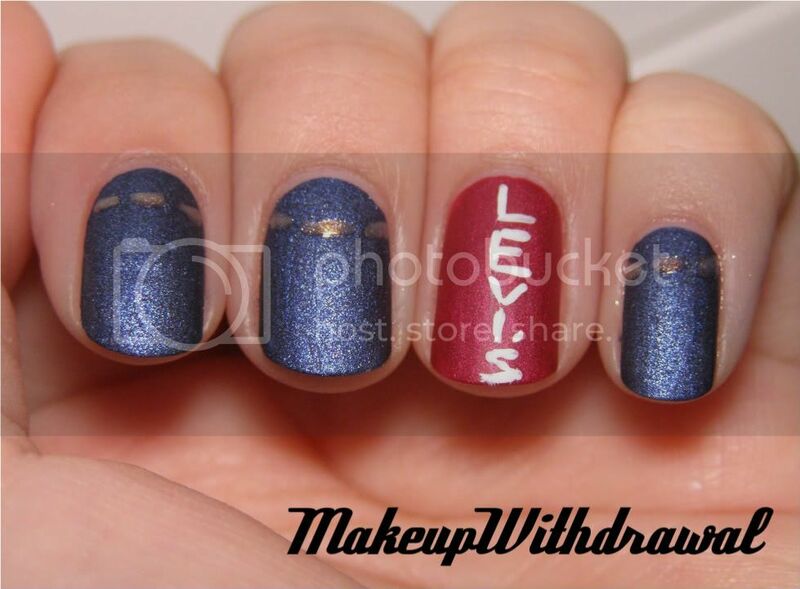 Today's blue nails made me think of blue jeans, so I used a classic pair of Levi's as inspiration. I used OPI Russian Navy Suede, the finish matched blue jeans perfectly. I also used Zoya Posh as the red color for the label, Ulta Snow White as the white lettering and finally- a mixture of CND Effects in Copper Shimmer and Gold Shimmer for the threading detail. I'm sorry I haven't really responded to comments, I'm a little behind because my boyfriend is in town! Tomorrow though, I promise I'll sort them all out. OmG this is seriously awesome!